We have gone one step further in developing our Purus Line and Purus Corner designer floor gullies. 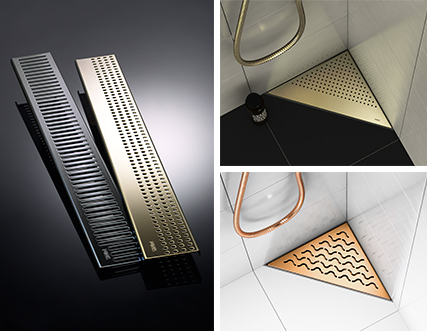 When we launched Line and Corner in Gold & Onyx in spring 2014, we wanted to show that it is possible to have greater personal freedom of choice in your bathroom, while they emphasise a uniform finish. The fact is that the bathroom is on its way to becoming the home's most personal room, inspired by travel and hotel environments. A room where the day starts, a room where we are spending more time, a room where we want to be ourselves, a room where there is great personal freedom of choice. A strong trend is the use of wall tiles, floor tiles and mosaic tiles with a metallic lustre. Purus floor gullies in gold, rose and gloss black fit perfectly in this context. They have the same function and quality as traditional floor gullies, but a shape and design that provides greater freedom of choice. Position them close to a wall or as a shower border and the result is a more uniform and stylish floor surface in the shower area. The choice was simple when launching a new shade in Purus Limited Edition. It had to be Rose Gold. A beautiful colour which conveys a warm feel and a pleasant lustre and which suits most settings. Rose Gold is an interior detail which embellishes and creates a harmonious overall impression in the bathroom. Quite simply, puts an additional gilt edge to everyday life.